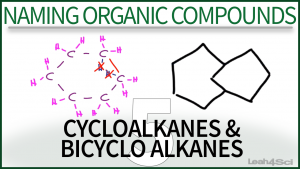 This tutorial video gives you a basic approach for naming cycloalkanes and bicycloalkanes using my ‘puzzle piece’ approach to IUPAC naming. Included are examples of simple cyclic compounds and substituted bicyclic organic compounds. This is Video 5 in the Naming Organic Compounds Video Series. Click HERE for the entire series. I do not know how to thank you for putting up all these beautiful practices, you made it understandable for me . glad to help Joe. When is your exam? do you have any videos demonstrates isomerims ?